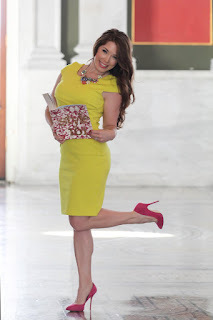 Secrets of a Stylist: Hey Cupcake! How fun is a little pop of cherry red to brighten up the work week?! I love a colored shoe to make an outfit pop. And while I'm not normally one to match my shoes to my purse (so old school!) I feel like with a neutral outfit the cherry red purse and cherry red pumps is just perfection. This combo can work great with any outfit you want to turn up the volume on. I love wearing these pumps and bag with another dress from the boutique that is black with bright red flowers to create a really lush effect. I found this purse last year from DSW (it's by Aldo, my fave;) but this one has a very similar vibe (*and is an awesome price!) If you're looking for a fun work tote in a similar color this one would be great too! Also I'm loving this cute top from Cosita Boutique for summer! It's cool and crisp, and something you could easily dress up or down. I'd add a navy blazer to this look to make it work appropriate. Toss off the blazer and you're ready for whatever fun stuff you may have planned for apres-work! *I couldn't find glasses exactly like the ones I'm wearing, but these have a similar feel and I think they'd look amazing with this look! 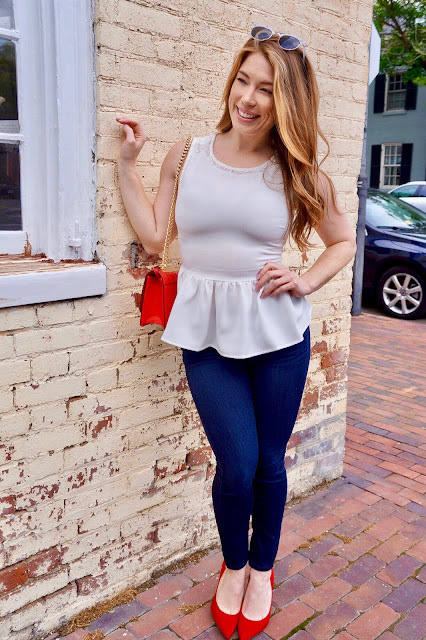 This top is super figure flattering too because it's structured and defines your waist really nicely, while the peplum is very forgiving of the lower stomach area. A comfy, chic, transitional piece that's perfect for the week! Happy Hump Day! Hope everyone has a wonderful day today!